What an album for a party! And carnival is ahead of us, so this fits as well. If you compare Tom's solo album with the last album of Sodom, then his main band will just be on no. 2! 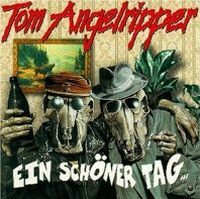 German drinking songs on a speed and trash metal basis. The traditional German drinking songs like In München steht ein Hofbräuhaus, Udo Jürgens' Der Teufel hat den Schnaps gemacht or Caramba, Caracho ein Whiskey sound quite good. Tom got help for e.g. drummer extra-ordinary Jörg Michael. Tom, you are cult!